Offering you a complete choice of products which include oil gas fired vertical thermic fluid heater and manual thermic fluid heater. 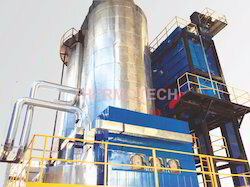 The Oil Gas Fired Vertical Thermic Fluid Heater systems essentially comprises of a fully automatic packaged Oil/Gas fired heater. As a result thermic fluid can be heated up to 300°C at near atmospheric pressure, with efficiency as high as 87% on NCV of Oil/Gas fuel. 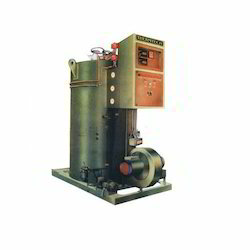 The capacity ranges from 1 lac kcal/hr to 25 lacs kcal/hr in Oil/Gas firing. This is designed with an integrated combustion chamber made of M. S. Seamless/ERW boiler tube of adequate size, accurately designed concentric two start helical coil placed in insulated and mild steel shell ensuring optimum heat transfer. The combustion cambers designed as per DIN 4754 to maintain safe distance between coil tube surface and burner flame ensuring longer thermic fluid life. The system gives 87% constant on NCV. All the Vertical type Thermic Fluid Heater are equipped with standard adjustable pressure jet-atomizing burner. The system comprises of electrical pre-heater (for F.O) which heats the fuel oil at the temperature of about 120°C. Here the hot thermic fluid oil is circulated in the system by a high temperature duty C.S. body centrifugal pump set of required capacity flow rate and head. The pump is provided with gland and bearing cooling arrangement coupled with suitable electric motor by a pull out type coupling. Stack Temperature Switch - A blind temperature controller cut of burner, put in electrical lock out and sound an alarm if the stack (flue gqs) temperature exceed to preset temperature. Liquid Level Switch - A Magnetic float level switch cut-off burner actuated indicator lamp and sound an alarm in case of low level of Thermic Fluid in the expansion tank. Low Fluid Pressure Switch - Differential pressure switch actuated indicator lamp, sound alarm and put the burner in electrical lock out in case of no-flow or low fluid pressure of Thermic Fluid Oil. Drain tank and Top up pump. 3. Low/NO Flow of Thermic Fluid Differential pressure switch connected across intel and outlet headers signals low flow alarm in case of low fluid pressure of Thermic fluid in coils.